Cuchifritos Gallery and Project Space is pleased to announce A Curious Thread, curated by DTL Projects, a collective initiative by contemporary art curators. This group exhibition, the debut presentation by DLT projects, offers the work of five emerging artists, selected and brought together by DTL Projects, who collectively argue for new, post-ironic 21st century romanticism. Focusing on the agency gained by artists in the studio, A Curious Thread explores the development of a new movement – one that reinvents and redefines a previously out-of-fashion, well-trodden trope. James Weingrod’s self-illuminating grandfather clock, Max Glaser’s fragmented wood and mirror constructions, and Maria Jose Duran’s yarn shelters mediate and explore transcendent icons of children’s stories: the looking glass from Alice in Wonderland and the grandfather clock from The Nutcracker. Lori Merhige’s installation, Matriarch, explores family mythology and personal narrative through a reconsideration of a family heirloom – her grandmother’s embroidery – repositioning it as part of a larger installation driven by loss and reconciliation. The artists in A Curious Thread are participating in or are recent graduates of M.F.A. programs in New York City. Max Glaser received a B.A. with Honors in History and Literature from Emory University in 2008. He is a second year M.F.A student at the School of Visual Arts. Max sees his studio as a laboratory where he can reinterpret the memories to which he has strong emotional connections – such as his childhood fascination with monsters and the decorative surroundings of his southern upbringing in Atlanta, Georgia. He works with found materials including wood, glass and other items associated with construction. His desire to create stems from an innate need to fill spaces. Lori Merhige received a B.A. from the School of Visual Arts in 1999 and her M.F.A from Hunter College in December, 2009. She shares studio space with James Weingrod in Bushwick, Brooklyn. Lori has exhibited extensively during the time between her studies, in addition to managing her family’s lace company. She finds inspiration in the textile crafts that have been lost or taken for granted in contemporary times. Storytelling and fantasy inform her practice and add a narrative layer to her crafted surfaces. Tom Pnini received his B.A. in Education and Art Teaching from Hamidrasha Beit Berl College in Kalmaniya, Israel in 2008, where he was honored with the Outstanding Artistic Excellence Award the same year. He graduated in 2010 with his M.F.A. from Parson’s School of Design at the New School University. His recent series, the “Demo” projects are interventions in the public space that use some of the same characteristics as a theatre set to create playful, surreal, large-scale illusions captured on video and presented as short films. Like all good theater, the viewer is both aware of the project’s artifice and beguiled by the fantasy presented. Maria Jose Duran received both her B.A. in Fine Arts and a High School Teaching License from at Universidad Finis Terrae, Chile in 2006. In 2008, she was awarded a Fulbright scholarship (2008-2010) and the Chilean National scholarship (2008-2010). She graduated from the School of Visual Arts’ M.F.A. program in May 2010. 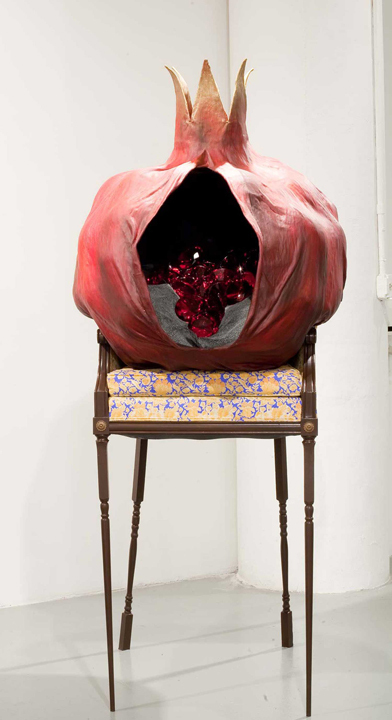 Using childhood as a referent, Duran explores the interconnection of vulnerability – fear – protection as an emotional chain that supports her practice and guides her interest in soft materials that are capable of maladroit, visceral transformations. James Weingrod received his B.A. in Visual Arts from Brown University in 2004, where he was honored with the Roberta Jocelyn Award for Excellence in Art the same year. A graduate from the Hunter College MFA program in December, 2009, James has set up a shared studio space with Lori Merhige in Brooklyn. He seeks to engage the viewer’s imagination by refashioning domestic items as portals to another realm of contemplation and existence. A Curious Thread connects to the area’s history of production and craftsmanship. Merhige’s grandmother grew up on the Lower East Side, working as a seamstress there, and Merhige’s work offers a modern interpretation of that legacy. Glazer, Pnini, Duran, and Weingrod, while not immediately connected to the area, offer work that is informed by the hand-made, tactile aspects of craft. Juxtaposed with the bustling theatre of Essex Market, a reminder of the origins of the Lower East Side,A Curious Thread harkens back to a previous era, when the buildings of the Lower East Side were home to factories and tenements, life played out between both public and private spheres, and the economy of the area included textiles, furniture makers, and theaters.